ANASA satellite that spent seven years studying Earth's polar regions ended itssuccessful mission Monday by plunging back to Earth on purpose to burn up in theatmosphere. Somedebris from the Ice, Cloud, and land Elevation satellite ? known as ICESat ? fellinto the Barents Sea north of Norway and Russia at approximately 5 a.m. EDT (0900GMT) Monday, according to the OrbitalDebris Program Office at NASA's Johnson Space Center in Houston. TheICESat mission has led to scientific advances in measuring changes in the massof the Greenland and Antarctic ice sheets, polar sea ice thickness,vegetation-canopy heights, and the heights of clouds and aerosols. "ICESathas been a tremendous scientific success," said Jay Zwally, ICESat'sproject scientist at NASA's Goddard Space Flight Center in Greenbelt, Md. "It has provided detailed information on how the Earth's polar ice massesare changing with climate warming,as needed for government policy decisions." ICESatdata showed the rapid thinning of Arctic sea ice, which provided criticalinformation for revising predictions of how soon the Arctic Ocean might be freeof ice in summer, explained Zwally. It also showed how the rate of ice lossfrom Greenland, which is contributing to the rise in sea level. "Thanksto ICESat we now also know that the Antarctic ice sheet is not losing as muchice as some other studies have shown," Zwally said. UsingICESat data, scientists were able to identify a network of lakesbeneath the Antarctic ice sheet. 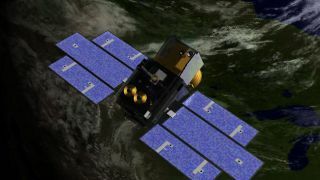 Theorbiting ice sentinel was launched in Jan. 2003 as a three-year mission with agoal of returning science data for five years. It was the first mission of itskind ? specifically designed to studyEarth's polar regions with a space-basedlaser altimeter called the Geoscience Laser Altimeter System. After15 laser-operations campaigns and seven years in orbit, the ICESat sciencemission ended in Feb. 2010 after the failure of the spacecraft's primaryinstrument. Missionflight controllers fired ICESat's propulsion system thrusters from June 23 toJuly 14, safely reducing the lowest point of the spacecraft's orbit to 125miles (200 km) above Earth's surface. Thatorbit then naturally decayed until all remaining fuel on the spacecraft wasdepleted. The atmospheric drag then slowly lowered ICESat's orbit until itre-entered the atmosphere. Beforeits final descent to Earth, mission flight controllers predicted that the vastmajority of ICESat would burn up during re-entry. Ofthe spacecraft's total mass ? about 2,000 pounds (907 kg) ? only a smallpercent was expected to reach the Earth's surface. Somepieces of the spacecraft, weighing 200 pounds (90.7 kg) altogether, were expectedto survive, but the risk of any harm caused by this debris was estimated to bevery low. "TheICESat team has done a marvelous job to ensure that the spacecraft is removedas a hazard to other spacecraft and as a potential source of future orbitaldebris," said Nicholas Johnson, NASA Chief Scientist for Orbital Debris atNASA's Johnson Space Center in Houston. And,despite the end of ICESat's mission, NASA's observations of Earth's polarregions will continue, agency officials said. NASA has begun development ofICESat-2, currently planned for launch in 2015 and included more advancedinstruments.